I'm doing an experiment with my Instant Pot multicooker tonight. I've seen many mentions of people cooking meat from frozen in it. I made a small batch of canned tomatillo salsa a couple weeks ago, so I'm using a pint of that as the liquid and two pork shoulder steaks. After they cook at pressure, I'll add a couple servings of farmers market green beans and cook those with the sauce. We'll see how it goes. 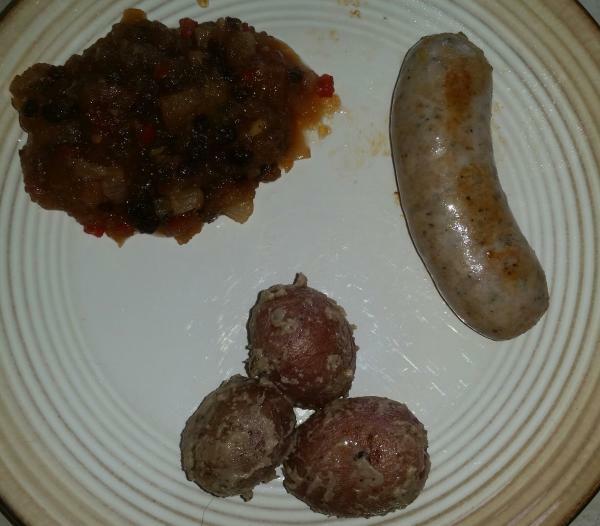 Craig's homemade pork garlic and sage sausage with salt crusted small red potatoes and granny smith, red bell, onion, currant and ginger chutney. My mouth is watering That chutney sounds like a great flavor combination. New recipe. Report and pic to follow when done. Leftover tuna salad on onion roll, and leftover cream of asparagus soup. I'm having the leftover grilled country style pork rib from yesterday, sliced cucumber and radishes, and a bowl of watermelon. Warm day here today so that should hit the spot. I have an asparagus quiche in the oven and there will be a mixed salad with Dijon vinaigrette for dinner. The sausage also had ginger in it. I forgot to put that in my original post. The chutney was good, though I ended up adding more brown sugar because it was too vinegary. Ended up being great after the addition. Maybe cut down vinegar by 1/4 cup and also cut cooking time by about 10-15 minutes or so because it basically turned into applesauce.